Fig. 1—One of two parallels—each has a notch for a locating key. Locating dies on the bolster centerline quickly and accurately is an essential quick-die-change (QDC) task. The alternative to having a good method for centering your dies is time wasted prying and bumping dies into approximate location, often to find that jobs run scrap in spite of laborious trial-and-error efforts. Good QDC centerline locating methods exist, including use of centerline keys and locating pins. Fig. 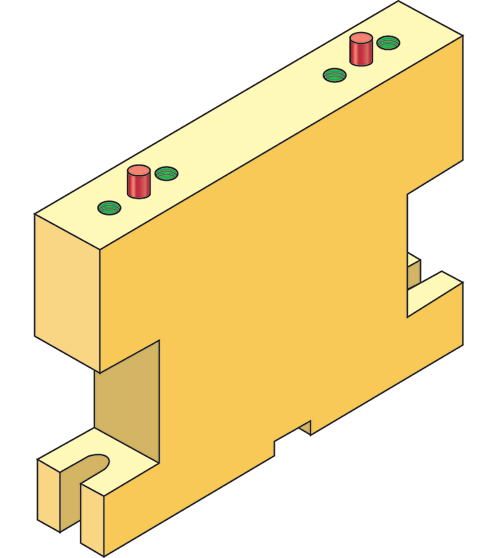 1 illustrates a standard parallel design for attachment to the lower die shoe that features a locating slot. It is important that both the parallel and press bolster are located with snug-fitting dowels. The screws attaching the parallel to the die shoe must be sized to withstand emergency stripping loads in the event of a double hit. Fig. 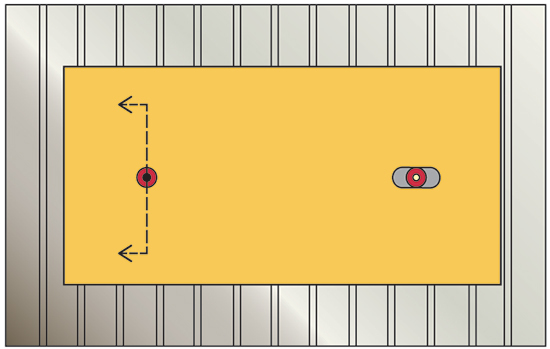 2—An example of bumper-pin location. Good practice: Mill a slot 1 in. wide by ½-in. deep from left to right in the press bolster, to permit the use of 1-in. square keys for locating dies fitted with parallels of the type shown in Fig. 1. 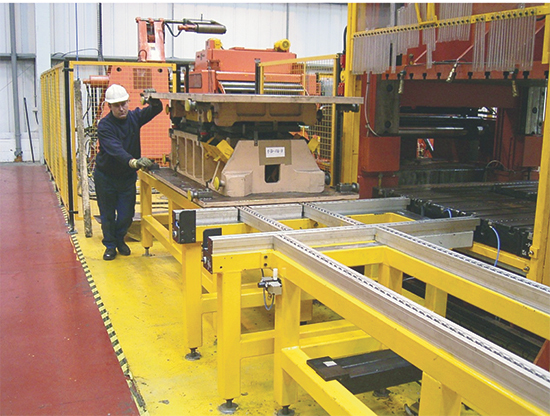 Dies and presses equipped in this can be set up accurately with fork trucks—or a crane in the case of moving bolsters. To permit ease of placement, mill the notch in the parallel approximately 1.5 in. wide. The die can be lowered over the key and located with a nudge of the lift-truck forks, or can be correctly placed with a crane. Fig. 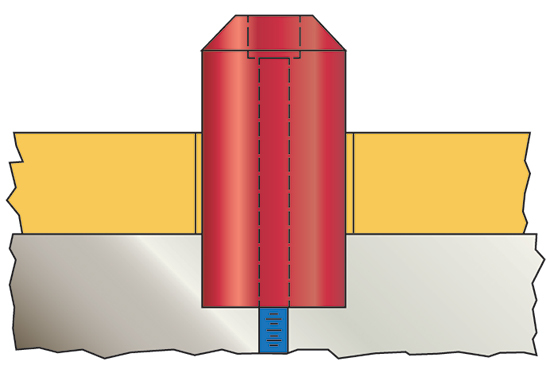 2 illustrates use of bumper pins to locate a lower die shoe or subplate. Fig. 3—Section through the large centerline locator. Good practice: Bore standard bumper-pin holes precisely into the press bolster. To accommodate different size die shoes, bore additional pairs of locator holes. Bumper pins fit into these holes and accurately locate the subplate’s standard notches. This method is particularly suitable for smaller dies set with a fork truck, as well as heavy dies set with a die cart. Stampers also use bumper pins for accurately setting dies on a moving bolster using a crane—there is no danger of a pin binding as is the case with large centerline locators. Large, typically 3-in. or larger locators find use for moving-bolster applications to accurately locate the lower die shoe or subplate. Many new presses with moving bolsters are fitted with these locators. Fig. 4—Centerline locating pins must fit snugly. Good practice: Bolt the pins to the bolster and carefully lower the die over the pins for setting. Fig. 3 shows a plan view (looking downward) of the bolster, pins and lower die. Accurate location requires that the pins have only a small clearance in the lower die, typically 1⁄16 in. (Fig. 4).